The silly season is well and truly here and in less than a week we’ll be sitting by the Christmas tree opening presents and lavishing our eyes upon a feast of festive culinary delights. Consuming until our bellies are sated, then devouring even more until the button on our J Brand jeans indiscreetly pops open. Christmas, a time of perpetual joy, peace and stuffing ones face. But until then from the sound of things, most of us are yet to find our Christmas spirit. Myself included. Where has it gone? Or why it has remained dormant is beyond me. And though I can’t produce a miraculous cure for a case of bah-humbug nor conjure a location spell for finding the sneaky little bugger, I do believe these little Rudolph The Reindeer caramel tarts will help ease one into that Christmas effervescence. And if its cute little face doesn’t bring you a smile or sense of cheer then it’s gooey, caramel insides definitely will because it’s caramel. 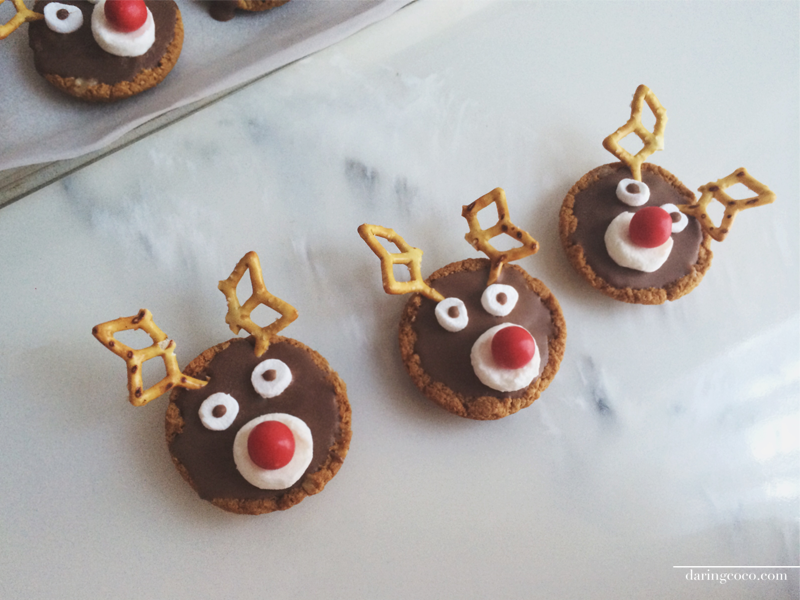 Now, don’t be fooled by these Rudolph The Reindeer caramel tarts and their appearance. You need not be a skilled craftsman nor patisserie extraordinaire. They’re actually pretty easy to produce and that includes the decorating too. But to be honest the decorating can be annoyingly fiddly at times and if you’re a perfectionist like me then probably frustrating at the best of times but trust me, it is worth it. Preheat oven to 180°C / 350°F. Using a muffin tray rest 1 biscuit above each hole and bake for around 2-3 minutes or until soft to the touch. Remove from oven and gently press the softened biscuits to form a slight cup shape then allow to cool. In a saucepan place sweetened condensed milk, sugar and butter and stir on medium heat for around 10 minutes or until mixture has thickened then remove and scantily fill biscuit bases with the caramel mixture. Melt the milk chocolate in a microwave then pour evenly over the caramel. To decorate (using the photograph as a guide), place one marshmallow sticky side up on the base of the tart, then place one Jaffa in the centre of the marshmallow, the sticky side will adhere them together. Add two of the halved mini marshmallows above the nose and using a skewer or toothpick add a small drop of the melted chocolate to the mini marshmallows centre to form Rudolph’s eyes. Place the cut pretzels above the eyes and press them gently into the chocolate mixture to secure in place. Set aside to firm then and serve.